Recently I finished up my Anger Management course in my community and the facilitator asked us to ask ourselves the question, who am I? He said people do not know who they are and it takes most people a lifetime to find out who they are. “I bet you guys in here don’t even know who you are” he said. This Anger Management and the Facilitator is offered within our Communities Health Centre and like the many other Healing Lodges and Treatment Centres within the “Aboriginal Industry” it prides itself with holistic healing and utilizing our culture to benefit our sick people. However sends them back into a Colonized Community where the main issues of Colonialism is what needs the healing not the individual because the individual will keep coming back for more healing. I found this Anger Management Class very “mainstream” and Christian in what was being taught and only contradicted our Anishinabe Teachings. So here I am being asked to ask myself who I am which I found to be insulting in how the facilitator was intending and directing his psychology upon our people. Here we have an Aboriginal from outside of our community living in an mainstream setting teaching other Aboriginals mainstream ways of thinking. Sound Familiar? I was in this class to make it look good in White mans court. I was charged for Public Disturbance for voicing up against a Social Worker who I feel was in Breach of Confidentiality, Bias and Coercion. These illegally imposed foreign laws affect our communities greatly along with Social Worker’s who are not impartial in their behavior and who help send our people to Correctional Facilities which causes more problems then it tries to fix. Which is another topic in itself but relates all to what is going on in our communities and this situation here. In my community this certain Social Worker has been manipulating her Professional role as a Social Worker along with her accreditation of belonging to a certain Anishinabe Spiritual Society as clout so she can use her personal bias against members within our community. Calling the cops and incarcerating our peoples on fabricated or minor allegations. This behavior is hypocritical as she preaches on the Restorative Justice Talking Circle Movement. Sadly the cops listen to her and not the other side of the story because of her Professional and Spiritual Positions. She is now being investigated by her employer, the First Nation Band Council for her behavior as a significant amount of complaints by community members have been made against her. Who am I? I am Little Loud Hawk of the Loon Clan of the Anishinabe Ojibway Nation I am a Sovereign Anishinabe not an INAC Indian. I am to speak and speak loud just like that bird. I carry my Great Great Great Grandfathers name he also got into trouble for speaking up and rising the people up out of oppression. I am from the Loon Clan a Clan that nurtures the rising up of Hereditary Chiefs and the gifts of Diplomacy and Voice. I know who I am and I am not going to walk around all my life trying to find that out. This is not the first time I was asked within my community to think who I am. Many in my community ask me if I am a mixed up Indian because I wear my hair in a Mohawk cut with a growing braid in the back and because I fly the “Mohawk” Warrior Flag and go to Blockades. They say that only Mohawks are Warriors and block roads. They say us Ojibways don’t do those things..
Well sorry to disappoint those people but the hair I wear was common amongst Anishinabe, Haudenosaunee, and Wendat Warriors around our Great Lakes area throughout the eras. It signifies a Warrior who is currently going out to battle. Many do not realize that we are still in a war and if ever we needed warriors it is in these turbulent times. Just because Guns are not pointing at us doesn’t mean we are still not being killed or made prisoners of war in their jails. Our lands, earth and rights are being destroyed and dishonored so I attend Blockades, Occupations and Public Disturbances in not only just Mohawk communities but in other Indigenous Communities as well as in my own to help the people who need warriors to stand up to fulfill our responsibilities as Anishinabe. I fly the Unity Flag commonly referred to as Mohawk Warrior Flag because I know the teachings behind it. Louis Hall who was a Mohawk designed it to unite all Indigenous Peoples on Turtle Island. So I know very well who I am. This past summer the G8 G20 was held within our Territories where our Chiefs do not have a seat and were not allowed to participate in the talks. These meetings affect us greatly and our resources were most likely being talked about. I organized some actions but due to two deaths in my community those Actions were of no importance as being close to our families was at the time. 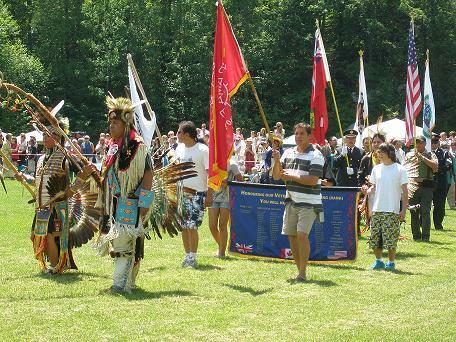 Many of our people however put on the feathers and sang and danced to honor the G8 G20 World Leaders and gave them the full authentic Indigenous Experience, a Powwow. 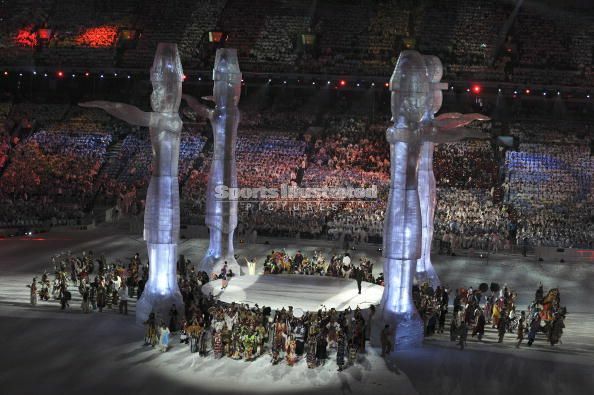 This was reminiscent of the 2010 Olympics held on illegally occupied Indigenous Territories where the beauty of our Culture was at the forefront and our issues were surpassed by the big show off of our Culture. Maybe these World Leaders would’ve benefited from an Authentic Aboriginal Anger Management Class or blocking their Transportation to showcase our third world living conditions on their way to Toronto distributing some authentic mercury poisoned water instead of maple syrup or stayed in a asbestos contaminated Resort or sit behind bars to get the full Aboriginal Experience or better yet if we want to showcase our dance at an event like the G8/G20 gatherings or Olympics maybe we can showcase the Ghost Dance, Wovoka style. Countless times “accredited Spiritualists” belittle our own people who are discovering their spirituality. The powwow circuit and beauty of our culture is masking the real issues when we step on to the Worlds Stage. I know who I am and who I “ain’t” and I am not the one who is “mixed up”. If Oppressive Colonial Governments and their Laws want to lock me up for Speaking Truth and Speaking Up be prepared for one hell of a Fight. You know who you are because your heart tells you this. I hope your response to the assumption made that you did not know who you were was similar to that of our ancestors: And WTF are you?